Apple's Siri is a great tool for safely automating iPhone tasks while driving, but under certain circumstances the virtual assistant can only be summoned by taking a hand off the wheel and pressing the home button. With CarPlay being anything but ubiquitous, Beanco Tech created a stopgap in Mobile Home. Not too long ago, we took a look at two non-CarPlay-enabled head units —the Scosche controlFREQ and Parrot's Asteroid Smart —and found both to lack a seemingly obvious feature many iPhone users depend on: a home button to trigger Siri. At the time, we noted the oversight as being indicative of the aftermarket audio industry as a whole. Unlike factory installed entertainment systems, third-party equipment sometimes comes with usability tradeoffs as audio system manufacturers try to hit a benefit-cost sweet spot. 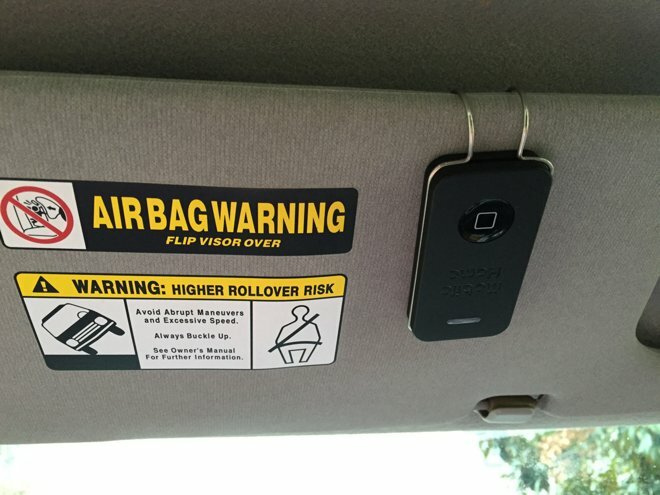 Beanco Tech makes a product they call "Mobile Home," which adds a large home button to your window visor or dashboard, allowing you to prompt handsfree use, Siri Eyes-Free, when using a stereo that takes audio from an iPhone. About the size and shape of an iPod nano, Mobile Home is an exercise in simplicity. It has a large circular button with a rounded square icon that looks similar to the home button used on iOS devices prior to Touch ID. Up top is a translucent elongated "pill" button that doubles as the lens for an amber colored status LED. 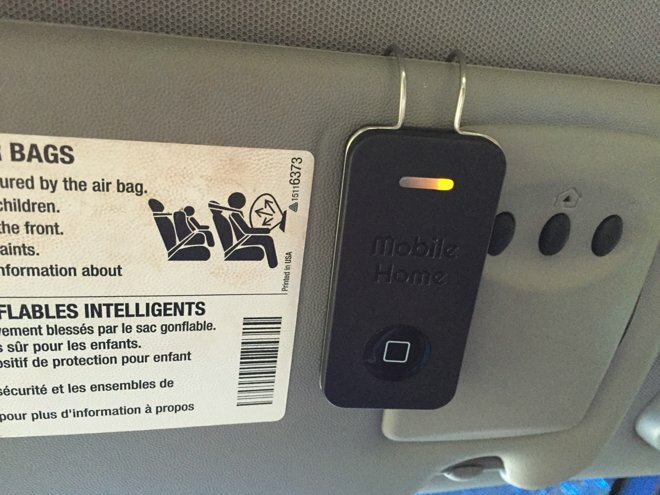 There's also a wire metal clip to attach Mobile Home to a car's sun visor, or Velcro to stick it to the dashboard. One of the most convenient things about the product is that it isn't a permanent install, making it easy to take from one car to another. 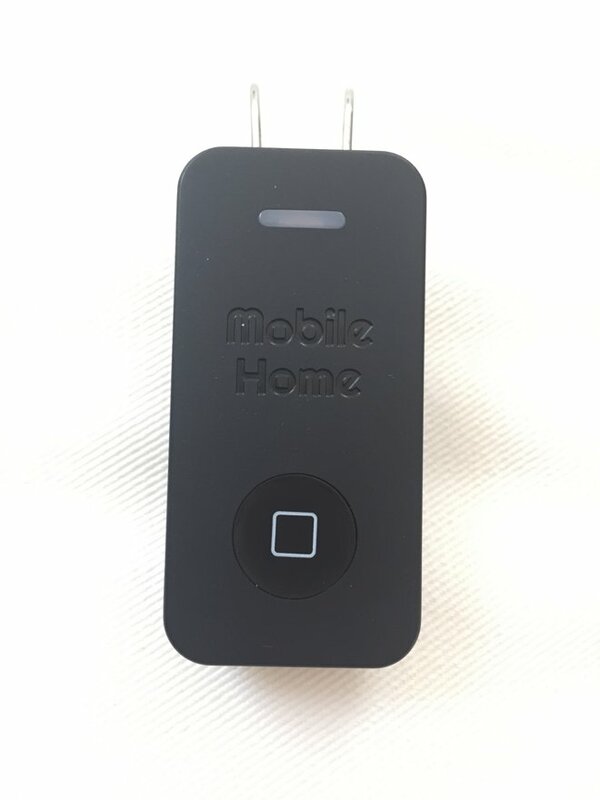 Long pressing on the rectangular button causes the LED to flash quickly and makes Mobile Home discoverable to iOS as a Bluetooth keyboard. And that's essentially what it is; a keyboard with the one key you need most, the home key. Once paired, pressing the large home button acts just like pressing home on the iOS device itself. If you have your iPhone configured to allow Siri to work when the phone is locked with a passcode, Mobile Home will just work. If you have restrictions set up, you'll have to unlock your phone before Mobile Home is able to prompt Siri; pressing the button will simply bring up the number pad for entering the passcode. Mobile Home is battery powered, using an uncommon lithium ion 2405n coin cell. It lasts a long time, and Beanco Tech has generously put an extra battery in the packaging for the day that it does run out. When it's not in use for a period of time, Mobile Home automatically powers off. Long pressing either button will wake it up, display an orange light briefly, and then the home button will work as expected. When it's paired, and not in power conservation mode, it responds immediately. There's no delay, or long-press required. It just acts that fast. This is really the easiest kind of product to like. It's simple. It does one thing well and solves a problem we commonly experience. 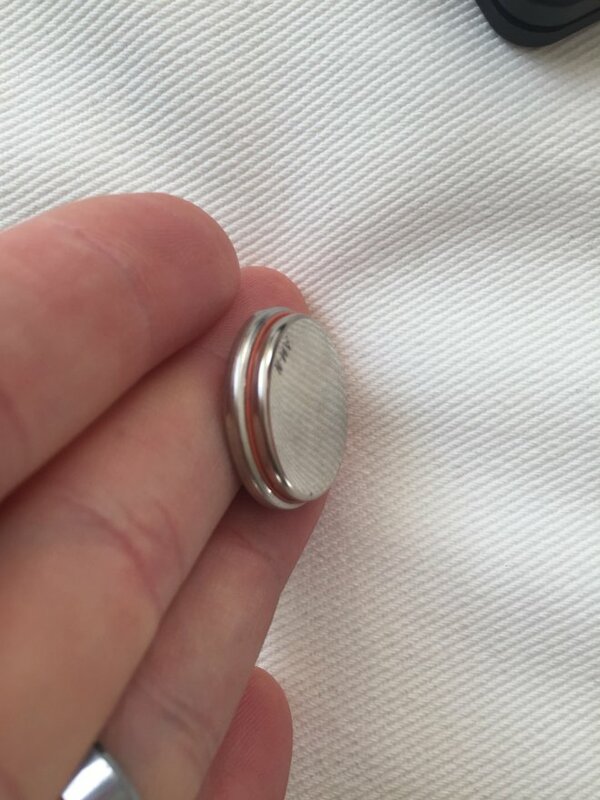 If pressed, the only thing we dislike about it is that it uses an uncommon battery size and requires that initial long press to wake it from sleep. Mobile Home also comes in at $80. That's not a small amount, but if you have a car stereo that's difficult to upgrade with line-in or handsfree capabilities, this is a way to make the experience that much better. So why do you need it if it's possible to plug your phone into a charger and say "Hey, Siri," to prompt voice control of your iPhone? It's mostly about simplicity. 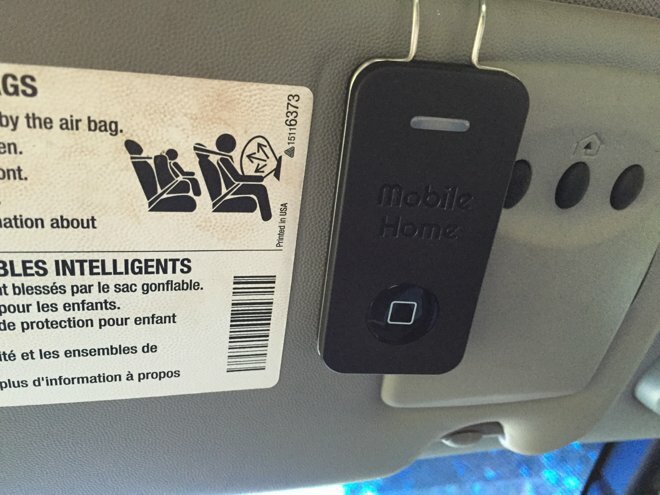 Maybe you don't always remember to plug in the phone when you get in the car. Maybe you don't take the phone out of your pocket, especially if it pairs with a factory Bluetooth handsfree system automatically. If this is the case, it may make sense to have a physical home button that prompts Siri for you. We would be remiss to not mention safety. People drive with their phones-as navigation, as reading incoming messages aloud, and conducting phone calls. Having a physical button in the same place in the car every time is no guarantee to make a drive safer, but it's more predictable than fumbling with the phone and having to take the phone out and plug it in to make "Hey, Siri" work. It's possible that having MobileHome in the car may make your drive safer. Duplicates existing functionality of "Hey, Siri"
Inconvenient need to wake from power conservation mode every drive. Mobile Home is available for $79 from Amazon.com.